Authorised retailer for Calvin Klein Watches. Free delivery, 30 day free returns and five-star rated service. Buy now with up to 12 months 0% finance. Calvin Klein are a leader in the world of fashion and their watch range is a fantastic addition to their fashion line. Calvin Klein watches combine fashion expertise with the know-how of Swiss watchmakers to create a range which is both stylish and functional. 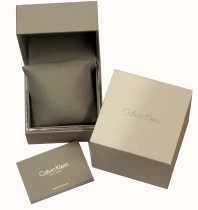 Calvin Klein take quality very seriously and they provide quality timepieces for life. Calvin Klein borrowed $10,000 from a childhood friend Barry Schwartz to open a coat shop in 1968, with this he started the company that would soon become a world famous fashion brand. During the 1970's and 1980's Calvin Klein expanded their range to include cosmetics, underwear and jeans. In 1997 Calvin Klein expanded into the world of watches, combining with the world's biggest watch manufacturers Swatch. The first range of watches released were wildly popular with a clean and contemporary style which launched the imitable idea of the "watch as fashion accessory." Today the Calvin Klein range features over 200 different Swiss made men's and ladies watches. Calvin Klein are a world respected fashion brand, which meant that a watch range released under the brand was always going to be noticed. Because Calvin Klein watches were always going to be noticed they invested time at effort in creating high class watches which feature top-of-the-range features combined with stylish designs. The City Range perfectly shows off the classically stylish design which makes Calvin Klein a great choice for your next watch. Calvin Klein could have chosen to create their watches cheaply somewhere else, but they decided to team up with the Swiss Swatch Group. Teaming up with the Swatch Group allowed Calvin Klein to harness the expertise of Swiss watchmakers to create quality, durable watches which would stand the test of time. A Calvin Klein watch is a high-class watch, with high-class style and top grade quality at an affordable price.